so is most of the data which we use for our database. But often, as is the case with Grace Gibson Productions who produced The Adventures of Charlie Chan, each episode was broadcast in Sydney several days ahead of Melbourne. I assume that other Melbourne based production houses would have done the reverse. So we Australians tend to list the year of release at this present time. Several Charlie Chan episodes are now in circulation in Australia. The mp3 versions were amongst the first Australian OTR episodes I found. Each ends with the announcer saying that “This is a Grace Gibson Production.” Indeed they were; the series began broadcasting in Melbourne on 3KZ on the 16th of October 1950. So for example, episodes 11 and 12 dates could be determined by a calendar check which will give you the dates they aired. 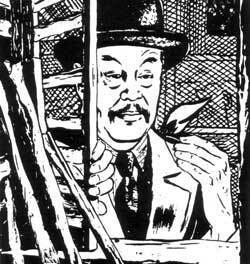 Serial thriller about the adventures of the Chinese detective, Charlie Chan. Aired 1950s- ; Monday on 3KZ at 8.00 pm. Produced from American scripts but adapted for Australian audiences. A previous series about Charlie Chan was broadcast from about 1936 with Warner Oland as Charlie Chan.